Culinary Artistic Team: Cate Hawks & Joe Mondejar & their wonderful staff! 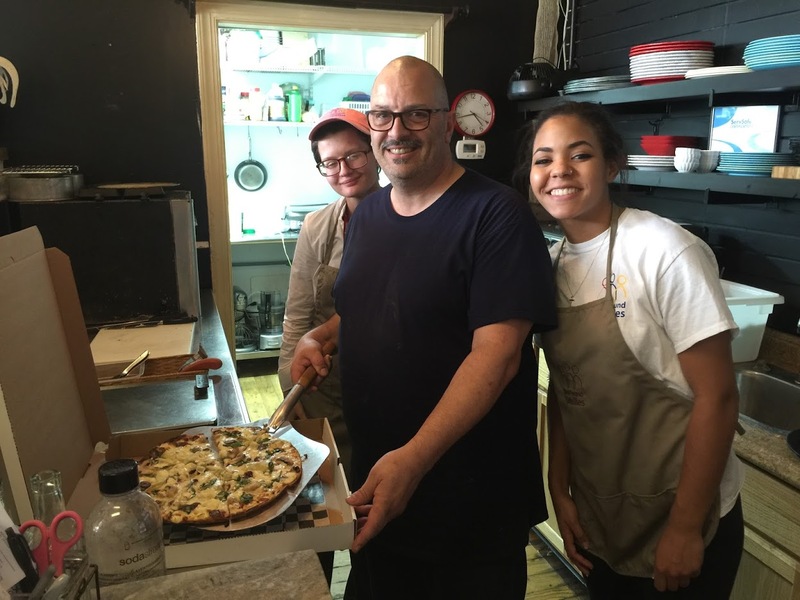 (Photo: Joe Mondejar (Center) and his staff in training make amazing Artisan Pizzas! As of July 1st The NewFound Gathering Place became an incredible Eatery too! This beautiful restaurant is located next to the Library at 113 S. Railroad Ave. is open for lunch and dinner Thursday through Sunday from 11am-8pm. Owner Cate Hawks has many talents which also includes interior design. She has created an industrial chic setting that makes you want to stay and relax. The venue is perfect for private catered events such as book clubs; bridal showers; knitting groups; and more. She takes reservations in advance and you will want to make this a ‘regular’ option. BIG NEWS! ASHLAND NOW HAS HOMEMADE FROZEN CUSTARD! Cate Hawks is also the the NewFound dessert and beverage artist. She makes French Vanilla Custard using an old fashioned ice-cream maker! Ask for it as soon as you enter the restaurant as she makes a limited supply each day. Cate also partners with Sugar Cain Bakery.